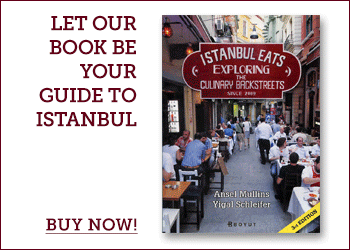 Istanbul’s after-midnight dining options tend to be of the offal variety – tripe soup, chopped lamb’s intestines – thought to be curatives after a night of hard drinking. Luckily, not all late-night eats in the city involve innards. At Dürümzade – a grill joint positioned right on the fringe of the rowdy, bar-lined streets of the Beyoğlu’s fish market – we’ve found a dürüm, or Turkish wrap, that’s equally satisfying at 2 a.m. or 2 p.m. If a sandwich is only as good as its bread, then any dürüm discussion is all about the lavaş, the Turkish tortilla that’s used to make it. Dürümzade’s thin ovular lavaş, rubbed with a mix of red pepper and spices, is far from the stiff, uniform discs found at many other dürüm joints. Like a good thin pizza crust, Dürümzade’s lavaş is filled with textural variations, bubbles, crispy edges and moist, chewy pockets. Stacked and hidden away, it incubates in a drawer below the charcoal grill. The skewered meat is put on a grill, which is fanned to the desired heat by the portly fellow guarding the lavaş. After one rotation of the skewer, out comes the wrap from its drawer. The grill master then drapes it over the kebabs cooking over the coals, creating a smoky tent for the meat while keeping the lavaş off of the fire directly. As the lavaş tent heats up, the spice rub on the wrap imparts its flavor onto the skewered meat below. While the lavaş is still flexible, the usta (“master” in Turkish) pulls it from the grill and covers it with a bed of chopped parsley, sumac-dusted onions and tomatoes, onto which he lays the freshly grilled meat from the skewer. 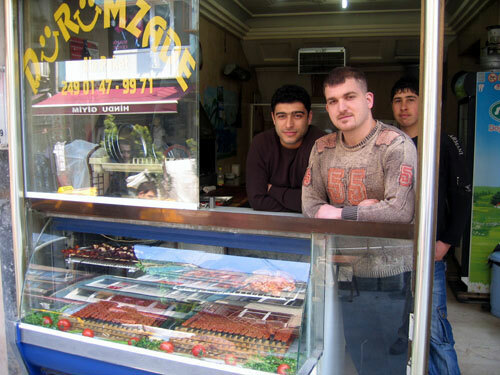 Then, like a cowboy deftly rolling a cigarette, he makes the dürüm (which will set you back a measly 3.50 liras). But before handing it over to the now salivating customer, he puts the whole thing back on the grill for a final crisping. Its a bit tricky. go to the back of the fish market/nevizade. find Pano as a landmark. keep the walls of the British Consulate at your back and walk toward the 6 lane street, Tarlabasi Blvd. just before you get to the big road you’ll find Durumzade on your right. just across the street is a really shady place called “Nihayet American Bar” a prostitution den, no doubt, but a good landmark. Good luck. I must say I’m a little disappointed about the place. The lavash, as you said, was better than any other I’ve tried yet the meat itself and the overall taste is not above average. 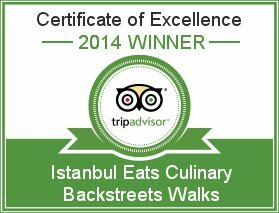 It’s probably one of the top three in Taksim but you should get out of Beyoğlu more often and try “Bağdat Ocakbaşı” or “Cezayir’in Yeri” in Güngören for a change (with a little help from google, I think you can find the place). We made a pilgrimage there last week, and it was terrific. We only had three days in Istanbul, but went back here on our way back home during a one-night layover, it was so memorable. About finding it, note two things. Two, note that they’ve changed their window since this snap; you won’t see that smiley yellow logo in the window; we walked past it twice without recognizing it. It is TINY. Great work on this blog, it was indispensable during our trip. Giritli and Dubb Indian restaurant, recommended in the Sultanahmet posts, were also excellent. I came to durumzade twice during my visit to Istanbul!! It was absolutely delicious! The place is very tiny, and even with the directions I found here… I walked right passed it without realizing it.. here’s a couple of pictures in case you’re wondering what it looks like now. 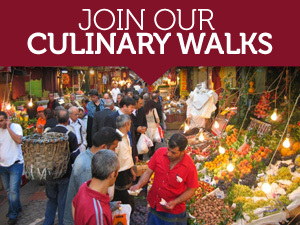 Another way to find the place, in case you’re walking around Taksim… go through the fish market “Balik Pazari”… and walk down until you reach the next street where cars can drive, make a right and you’ll see it on the right side. I’ve been dreaming about this place since I first saw Bourdain visiting it, and today I finally stumbled across it (I easily get lost in the narrow Nevizade/Beyoglu streets). Sat down and had an adana dürüm. Marvellous! The meet was juicy, the bread was crispy and seasoned, the vegetables were fresh. With a drink different from ayran it all set me back seven lira, a bit more than in 2009 but still a fair price. So much better than the run-of-the-mill dürüm joints on Istiklal Caddesi. Durum + ayran = 5.50. Best deal in Istanbul.